Buckingham Fountain in 1941, left, and bathed in color today. In 1949, Mrs. William T. Fambrough of Columbus, Georgia wrote the Chicago Tribune’s editor and publisher Colonel Robert McCormick with a question: If you had only three full days in Chicago, what are the things you would see and do without fail? The Tribune’s Rita Fitzpatrick responded with a list of things to see and do that would fill Mrs. Fambrough’s three-day visit in September 1949 to bursting – which made us wonder: If Mrs. Fambrough returned to Chicago today, what could she revisit? And what would we advise Mrs. Fambrough not to miss in the Chicago of 2016? Mrs. Fambrough’s trip started on a Sunday, so the Tribune’s Fitzpatrick suggested beginning with a church service at some of the city’s “most historic and beautiful churches in and near the Loop.” The Trib suggested visits to Holy Name Cathedral, Chicago Methodist Temple (today called the First United Methodist Church), Fourth Presbyterian, or St. Chrysostom’s Episcopal. Good news – not only are all four churches still standing, but First United Methodist Church also remains tallest church building in the world! And better news – the Chicago of 2016 has stunning houses of worship for people of all faiths to visit, though not necessarily in the Loop. Muslim visitors can pray at the Chicago Mosque Maryam in the South Shore neighborhood; Jewish visitors can spend Shabbat at the Chicago Loop Synagogue; and Buddhists can pursue enlightenment at Midwest Buddhist Temple in Lincoln Park. Next, the Trib offered up a newfangled idea to follow up on communing with a higher power: rather than settle for a boring breakfast or a lackluster lunch, visitors could indulge in “a combined breakfast and lunch” called “brunch” at a swank hotel or eatery. What novelty! Well, if Mrs. Fambrough was thrilled with her stuffed cantaloupe in 1949, what’s on offer in 2016 would blow her mind. A Sunday stroll through downtown Chicago or any number of surrounding neighborhoods yields just about any food you can imagine for brunch – donuts, wonuts, cronuts, Bloody Marys topped off with a cold slice of pizza – it’s all there. And a little spot named Lou Mitchell’s that opened in 1949 at the beginning of Route 66 has since become a brunch mecca. And then it’s off to sightsee! In 1949, Chicago had already established itself as an architectural wonder – and what better place to start than getting a bird’s-eye view from the Tribune Tower observation deck? Back then, visitors could climb to the 25th floor observatory to see Chicago’s jeweled necklace of beaches, the “gleaming white Wrigley building” and the Palmolive Building with its heralded Lindbergh Beacon sweeping over the city in a 360-degree circle. The Tribune Tower observatory is no longer open to the public, but that’s okay – now it’s dwarfed by ever-higher observatories in the soaring skyscrapers that define Chicago’s modern skyline. Visitors today can tiptoe out onto the Willis Tower’s Ledge or tip over at the John Hancock Observatory’s Tilt. Those looking for a less-lofty perch could also visit Cindy’s Rooftop at the Chicago Athletic Hotel, with its sweeping views of Millennium Park and Chicago’s public art crown jewel and all-time selfie spot Cloud Gate, colloquially known as The Bean. One more thing: the Palmolive Building’s Lindbergh Beacon was shut off for decades but is once again shining – although these days, it only sweeps in an arc over Lake Michigan so as not to shine into the living rooms of high-rise apartments that have sprung up around it. What a difference 67 years makes! Left: A view from the Tribune Tower observation deck in 1952. Right: The Tribune Tower today. Wrigley Field outfield scoreboard, 1948. Since it was the Tribune, there was no mention of the White Sox – but never fear, fans of the designated hitter: your day on this trip comes later. On the way back to the Loop, the Trib recommended a stop at the Garfield Park Conservatory, which happily remains one of the “world’s finest floral lands” – and today, a brand-new glass roof sparkles overhead in its greenhouse after a 2015 restoration. The Trib also mentioned a swing by “bustling” Union Station. It’s still pretty bustling with over 100,000 passengers a day, and it’s undergoing a $12 million improvement, including renovation of the façade and the Canal Street staircase of "The Untouchables" fame. Back in 1949, visitors could stop by the WGN’s “Stars of Tomorrow” radio show broadcast at WGN studios in the ground floor of the Tribune Tower – but since that has become a show of yesteryear, we suggest getting a glimpse of comedy’s stars of tomorrow at Old Town’s Second City theater, where stars like Tina Fey, Stephen Colbert and Amy Poehler cut their improv teeth. By now, night has fallen and it’s time to return to the Loop for the evening – but not before seeing the beloved Buckingham Fountain’s “breathtaking show of colored, dancing water,” which has taken our breath away from April to October ever since 1927. That is one whirlwind Sunday! Hope you’ve saved some energy, because there’s still plenty to see and do with your next two days in Chicago. The Tribune kicks off Monday morning at the venerable Art Institute of Chicago, where art lovers could experience “one of the greatest collections of modern art.” Not only is the Art Institute still around and thriving, it now has a new wing just for modern art, appropriately named the Modern Wing. If you’re looking for even more modern art, you can also check out the much-younger Museum of Contemporary Art. 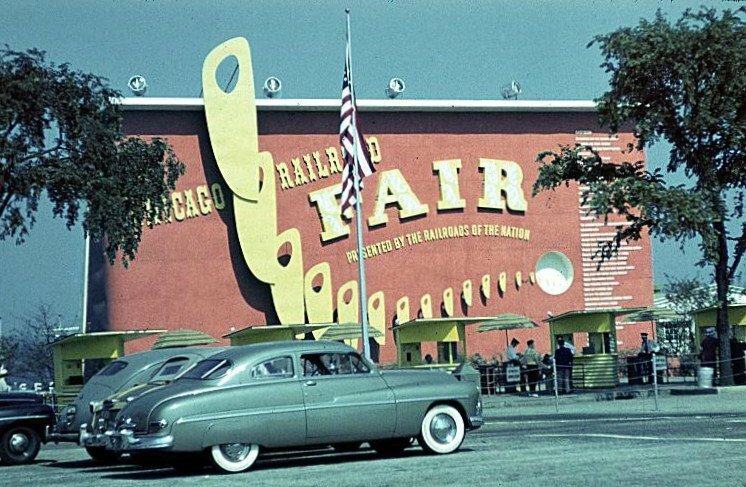 For the afternoon, the Trib proposed a stop at the Railroad Fairs held along the lakefront in the late ‘40s. Those fairs were short-lived, but summer in today’s Chicago is rife with street fairs large and small throughout nearly every neighborhood. Whatever your interest, there’s a festival, like the long-running Printers Row Lit Fest, Blues Fest, the 57th Street Fair and the Old Town Art Festival. And whatever your flavor, there’s a food fest – Ribfest, Taco Fest, and Burger Fest, for starters. Not to be forgotten, of course, is the granddaddy of all belly-busting Chicago street fairs: the Taste of Chicago. Nobody visits Chicago without gaining a few pounds. To close out the day in 1949, the Tribune recommended taking in a film at the twin Harris and Selwyn Theaters. They’re not movie theaters anymore, but you can still catch a show there – the theaters were renovated to house the Goodman Theatre Company, the city’s oldest nonprofit theater organization. Their stage productions range from the original to the familiar, and include perennial favorites like "A Christmas Carol." As ambitious as the Tribune’s reporter imagined tourists to be, even she admitted that it was a tall order to see all of Chicago’s museums in one day. She advises picking the subject areas that interest you most, which is advice we still find solid today. Are you a fish fan? An astronomy aficionado? A natural history nut? The Shedd Aquarium, the Field Museum, and the Adler Planetarium have you covered – in fact, all three of them have undergone additions and renovations that, in our humble opinion, make the museum-going experience more immersive than ever. These days, the story has gotten even stranger and more wonderful – a tornado rumbles, lightning crackles, a German submarine sleeps, and a jumbo jet soars throughout MSI’s halls. The only problem with MSI is that it’s too much for one day, so we recommend heeding Miss Fitzpatrick’s advice again by narrowing your focus to what interests you most and leaving the rest for a return visit – or visits. Here is one place where 1949 and 2016 widely diverge: the Tribune sent its tourists further west, all the way to Midway Airport, and proposed a dinner watching planes land and depart while enjoying dinner at the elegant Cloud Room restaurant in the Midway terminal. The Cloud Room is no more, and the days of visiting airports for leisure are long behind us, but there’s still a place on the South Side to watch things soar: U.S. Cellular Field, where White Sox set off fireworks with home runs and fine Chicago-style dining comes on a bun. And for your last night in Chicago, the Tribune suggests dancing your way downtown to one of the nightclubs in downtown hotels or on Rush Street. In 1949, the Pump Room at the Ambassador East Hotel was the place to see and be seen, particularly in its legendary Booth One, where Humphrey Bogart and Lauren Bacall got elegantly wasted on their honeymoon. It was even name-checked in the Chicago anthems “That Toddlin’ Town” and “My Kind of Town.” The restaurant reopened in 2011 for tourists of today looking for a taste of Chicago’s Golden Age splendor. Humphrey Bogart and Lauren Bacall at the Pump Room. And then it’s time to head home! Even a jam-packed three days like this doesn’t come close to capturing, in the Tribune’s words, the “great symphony of sounds and sights” that is Chicago, but as they say – it’s a good start. March 2: Preservation Chicago has released its annual list of the most endangered buildings in Chicago, a list they usually call “the Chicago Seven” – but for the first time in 14 years, the organization has included an eighth structure. Feb. 23: Would you pay a toll to zoom past traffic in an express lane on the Stevenson? That's one of the big ideas the Chicago Metropolitan Agency for Planning has for the Chicago region. Geoffrey Baer has an exclusive look at their newest plan. Jan. 6: Not that long ago, air pollution from burning coal made the Windy City more like the Smoggy City. Our local history expert Geoffrey Baer tells us how Chicago cleaned up its act. He'll also explore the Kentucky Colony that settled in the city and the history of a pediatric hospital on the South Side.